In April 2002, Safecastle emerged from the warm, secure womb of my imagination to take on the world. Today, here we are, still learning and growing. Thank you to each of you for your business, friendship, and assistance in our efforts to make a positive difference in the state of personal preparedness. In that 10 years time, many of you who have been around long enough have benefitted from a few "ahead-of-the-curve" calls I've put forward in terms of pricing and supply warnings, etc. Today, I am giving you another heads-up. This is not at all official. No one from Mountain House has said anything to me, and I have not asked--though I will next week when they are back in the office, to see if I can get confirmation. But I am almost sure that we will be seeing significant price hikes for MH canned foods in the near term. This expectation is based on several indicators and my past 10 years of experience in this marketplace. Moreover, once that happens, we will see other storage food manufacturers follow the leader. When will this happen? July 1 is my guess--that is typically when MH price changes have taken effect in the past. Phase 4 of our ongoing Emergency Food Sweep series of storage food sales is midway thru its two-week duration. The maximum-allowed discount of 25% off Mountain House cans only has one week left. Several other major brands and varieties of storage food are also now on sale. And of course the ground-breaking Spring Rebate Offensive cumulative rebates for all foods purchased between April 1 and June 30 is in effect for buyers club members. 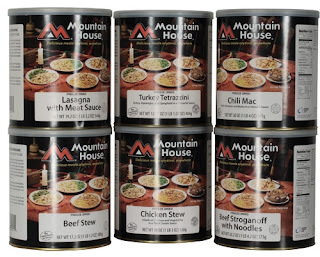 We are discounting all Mountain House cans in our store 25% for members and non-members alike--the maximum allowed discount. It ships free to the lower 48. Buyers club members additionally receive Royalty Rewards gift certificates for qualifying MH can-case purchases--$40 worth for every three cases in a single transaction (good toward the subsequent purchase of anything in our store, other than MH cans). The Spring Rebate Offensive is worth a 3-7% gift certificate rebate on all storage food purchased from April 1-June 30. Prices will very likely be going up soon (see email intro above). Some folks think they should be able to buy a year's worth of storage food for a few hundred dollars at the most. I think they believe that in a crisis, when all hell has broken loose, and they've lost any semblance of normalcy in their lives, and perhaps even a loved one or two, they will be satisfied with eating starvation rations of rice, beans, and sawdust. 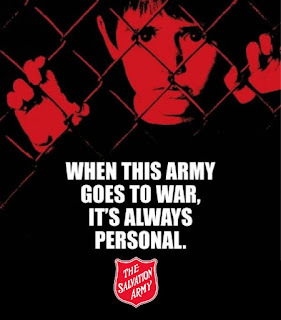 What I say to that approach is, just save the few hundred dollars and instead plan on getting your rations at the local FEMA camp or soup kitchen when they get around to setting up shop and herding you into your pen. I mean, really. Think about it ... in the darkest days of your life, when a major crisis has come calling and you are as down in the dumps as you will ever be, wouldn't it be nice to have some good, normal food? Would it not be a little uplifting to be able to look forward to your daily meals, knowing that at least mealtime will be something worthwhile in your day? That the food you have on hand is quality food that you know how to prepare and that you will enjoy ... and that you know will provide enough calories in the meal to satisfy you? 1. You may be willing to cut back on how many calories you will eat after or during a crisis. But don't plan to reduce your daily caloric intake below 2000 calories a day. Americans are accustomed to closer to 3000 calories a day. A minimum level of 2000 calories a day will be enough to sustain the average adult (though you will probably be hungry for a while till you grow used to that). Many storage food sellers misrepresent their time-period packages, saying, for instance, their one-year packages will supply 900 or 1100 calories a day. If they have any honesty in their bones, there will be some fine print somewhere that admits you will need to supplement your diet with other food. And as far as number of servings go--serving counts are irrelevant. Research what the legal definition of a serving actually is, and you'll see my point. Three servings of food a day will leave you literally starving, though most folks think that means three full meals. Finally--also know that chicken-flavored or beef-flavored dishes are going to be devoid of real meat. TVP is soy-based material, textured to imitate the feel of meat in your mouth. If you are a vegetarian, that might be OK with you. But many folks are not aware of that when they purchase bargain-basement food packages. 2. That said, cost is next to consider. This is where perspective is needed. How much do you spend on food every week or every month? Do you know? Well, the USDA knows. 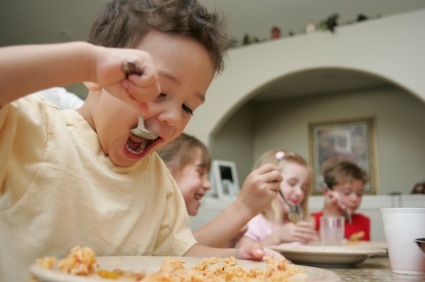 Here is a link to the latest Official USDA Food Plan: Cost of Food at Home at Four Levels, US Average, Jan. 2012. Now consider--this is about how much you spend at home for food, given your household size and your general budget, as well as ages of individuals in the family. I'm going to pull out a couple of numbers from the table here for the purpose of simplicity and enlightenment. Consider that one male, between the ages of 19 and 50 years old, with a moderate food budget, spends better than $292 a month for food at home. With a "liberal" budget, that man spends about $360 a month. Now how much more does that man spend eating out through the month? I won't venture a guess, but you can keep that in mind when you consider how much you spend on the food you are eating today. Knowing that most folks spend funds on eating out as well as eating in, I'm going to simply use that $360 a month food budget number. That means, if that man was to plan to put away good year-supply of food that he is used to eating, that he enjoys eating and that he knows how to prepare--he should logically expect to pay at least $4320 for that food--for one male adult. The fact that food is specially produced, prepared, and canned to last a long time--for decades in fact--may or may not enter his understanding of the value of that food, but he should take that into account as well. The cost and the real value of food continues to escalate. Today's purchase of GOOD quality storage food is an investment that many very smart people are making today. They know that when they make good choices in this area, their investment cannot help but grow in value. Think about it. Cheap, tasteless food you buy today is not going to be any better years from now when you need to count on it to keep you going. Vic Rantala owns Safecastle Crisis Preparedness Buyers Club. Shop online at www.safecastle.com and get club member discounts and free shipping all the time on the world's best storage food brands, such as Mountain House freeze dried food. Free Lifetime Membership at Safecastle (or gift certificate if already a member)-Act VERY fast! Our members get 20% discounts or more on most everything we sell, free shipping to the lower 48, and several buyers incentives and rewards. 1. Our favored option - Go to our store at www.safecastle.com Find a cool listing that you love and like or share it to your Facebook timeline. Include a short, heartfelt explanation as to why it is cool or important. Then go to our Facebook page and click on the message button and point out that you have added it to your timeline so we can have a look. (If only your friends can see your timeline, send me a friend request ... Victor Rantala). You'll also want to message me so I can send you your gift certificate code. 2. If you don't use Facebook, post a link to a favorite listing here in this linked SurvivalistBoards thread: http://www.survivalistboards.com/sho...38#post4078438 To get the full gift certificate, you will include an image and good, brief reason for why you like the product you are sharing. 3. Caveat: Good product referrals as described above will receive the full gift certificate worth a membership (or current members will receive a $49 gift certificate). That means, it will include an image or one of our vids, and a genuine reason why the product is cool. Something judged less than that will get a $25-value gift certificate or less (toward a membership for non-members). One gift certificate per person. We don't want to make this difficult--or hard to achieve ... on the contrary--we are simply trying to discourage trolls who might have less than honorable intentions. See our membership terms here. Please be patient as right now we are swamped with business and emails, etc. I will get back to you with your coupon or gift certificate code as soon as I can. What's Your "Plan A" - Bug-out or Dig in? Is "Plan A" to "get out of Dodge" in the event of a pending or sudden crisis? 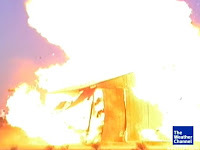 Or is "Plan A" to "bunker down" at home? An intelligent approach to crisis preparedness planning requires consideration of specific crisis scenarios as well as individual constraints and limitations. Thinking about it before the pressure is on helps you arrive at the right decision when the time comes. Pre-crisis--honestly assess your general options, constraints, overall risks, and best odds for surviving and thriving. Stick it out at home where your supplies, tools, and community support network are established. Bug-out to a hoped-for relative place of safety. Best odds are arrived at by looking at the strength and position of your home and community vs. the circumstances of the crisis. For most people, "Plan A" in many events would be to "dig-in" and fortify at home. However, there ARE events when bugging out is the smart move. Bug Out Or Dig In? Want Help Calculating Your Best Option? Share this tool with your friends and use it as a starting point for discussion. What a great way to break the ice about preparedness with those who are still "on the fence" about preparedness! Sunday, April 22 ... Phase 4 of our ongoing Emergency Food Sweep series of storage food sales kicks in. All the previously announced sale discounts in the Sweep continue. And of course, the ground-breaking Spring Rebate Offensive cumulative rebates for all foods purchased between April 1 and June 30 ... that's in effect and club members are racking up their rebate earnings as we go. The ever-popular Mountain House cans sale is Phase 4. Important to note--this Mountain House sale lasts only two weeks. 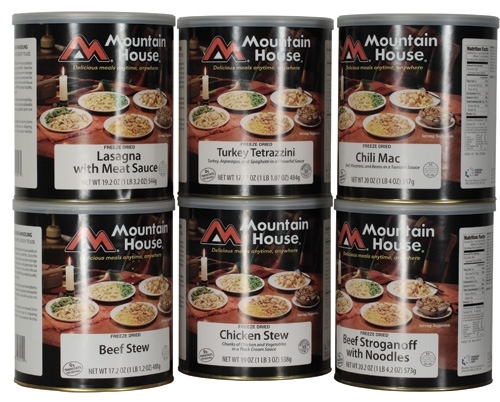 As you know, hands-down, Mountain House is the world's premier storage food. 1. We are discounting all Mountain House cans in our store 25% for members and non-members alike--the maximum allowed discount. Of course it ships free to the lower 48. 2. Buyers club members additionally receive Royalty Rewards gift certificates for qualifying MH can-case purchases--$40 worth for every three cases in a single transaction (good toward the purchase of anything in our store, other than MH cans). 3. The Spring Rebate Offensive is worth a 3-7% gift certificate rebate on all storage food purchased from April 1-June 30. Shop the sale here ... needless to say, all our storage foods are shipped fresh from the manufacturer and store for years and years ... in the case of MH cans, they store 30 years or more! That's peace of mind. Take advantage of our most ambitious U.S. emergency-food sale ever ... a building series of food sales over the course of about 12 weeks. We're discounting most every kind of emergency food line in our store during the Emergency-Food Sweep! 15% off all American Family Supply listings! 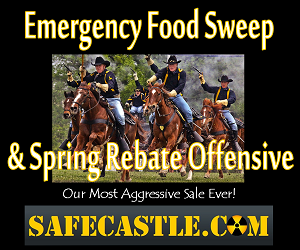 Remember--we are also offering to our buyers club members cumulative Spring Rebate Gift Certificates on ALL emergency food purchased at Safecastle from April 1 through June 30! Summary: In addition to our standard FREE shipping for everyone on everything we sell, and the 20%+ club member discounts on most everything we sell, and our Mountain House Member Rewards incentives, we're now also offering up our own hard-charging spring stimulus package including these limited-time sale discounts and purchase rebates! The implication of preparing to move Russian troops not only is to protect its own vital regional interests but possibly to assist Iran in the event of such an attack. Sources add that a Russian military buildup in the region could result in the Russian military potentially engaging Israeli forces, U.S. forces, or both. It's our most ambitious U.S. emergency-food sale ever ... actually a series of food sales over the course of about 12 weeks. We are discounting most every kind of emergency food line in our store at some point during the Emergency-Food Sweep! 10% off all Yoders, Keystone, and Grandma's Country listings! Summary: In addition to our standard free shipping for everyone on everything we sell, and the 20%+ club member discounts on most everything we sell, and our Mountain House Member Rewards incentives, we're now also offering up our own hard-charging spring stimulus package including these limited-time sale discounts and purchase rebates (details below)! Safecastle Royal Buyers Club member purchases of any storage food from April 1-June 30, 2012, via our online store's shopping cart will qualify for this Rebate program (must be logged in to your account for the purchases to qualify). Those purchases will qualify for as much as a 7% gift certificate credit (see below) to be used toward any future purchases in our online store before Sept. 1, 2012. 3% rebate gift certificate if their total member food purchases from April 1 - June 30, 2012 have not exceeded $2499. 5% rebate gift certificate if their total member food purchases from April 1 - June 30, 2012 have totaled between $2500 - $7000. 7% rebate gift certificate if their total member food purchases from April 1 - June 30 exceed $7000. Important: One Rebate Gift Certificate will be issued per buyers club member for the sale period. Members must email Vic with a request for the rebate gift certificate. Vic will email a rebate gift certificate code within one business day of the emailed request. Rebate gift certificates will expire September 1, 2012. These offers are for U.S. customers only. A dramatic retelling of Jesus’ last day. Hear from six individuals who were close to Jesus before his death on the cross, Good Friday. How fragile our intricate, modern weave of social and economic interdependence! A document prepared by the American Trucking Associations a few years ago is an excellent reference for what WILL happen when one of any number of proverbial monkey wrenches gets tossed into the gears of our smooth-running existence today. Important: read the whole doc here. "When Trucks Stop, America Stops"
We're pleased to launch our most aggressive U.S. emergency-food sale ever ... actually a series of food sales over the course of about 12 weeks. We are discounting most every kind of emergency food line in our store at some point during the Emergency-Food Sweep! We are also offering to our buyers club members cumulative Spring Rebate Gift Certificates on ALL emergency food purchased at Safecastle from April 1 through June 30! Summary: In addition to our standard free shipping for everyone on everything we sell, and the 20%+ club member discounts on most everything we sell, and our Mountain House Member Rewards incentives, we're now also offering up our own hard-charging spring stimulus package to those folks we call "too good to fail" -- including new temporary sale discounts and purchase rebates (details below)! Runaway government debts have triggered uncontrolled money printing that in turn will lead to inflation that will decimate portfolios, according to the latest forecast from "Dr. Doom" Marc Faber.